Ratchet Handles M6 x 25 Ratchet Handles (ALU handle + steelbolt) | DamenCNC B.V. These handles have a ratchet system inside. Such that when space is tight its still possible to easily fix it in place. When the connection is tight enough, its also possible to orientate the handle in the required direction. 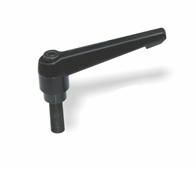 Handles are often used for making quick fix or release systems in clamping of materials. Heavy duty item steel and aluminium not plastic.